So you've set-up your new Hummingbird instance and you need to add a contact page. In this tutorial you'll learn how to add pages and work with templates. To get started, you'll need to open the file functions.inc.php that resides under the external folder. Note: This file is a common place to register stuff that you site needs and to perform run-time changes to it, so you'll find yourself adding code to it quite commonly. With that line of code, you've just told the platform that there is a page named contact (thus accesible via /contact) and that it will use a template named page-contact. 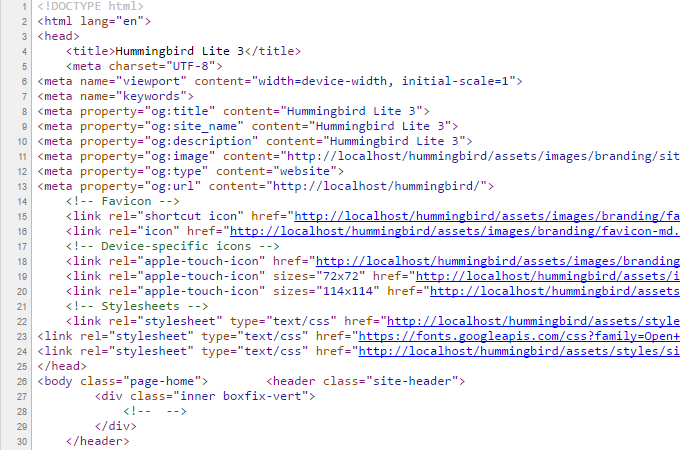 Hummingbird includes a very simple template engine that allows you to reuse and organize your code efficiently. In contrast to other frameworks that use middleware packages for its templating, adding lots of files and classes to your project, Hummingbird has a leaner approach to templates. In fact, PHP is a templating language on its own, and adding another layer on top seems a bit off if you want a high performance framework. So we took the keep-it-simple route and reduced our template support to a couple of functions: render() and partial(). But before getting started on the templating functions, let's create the template file itself. That is the Home page template. 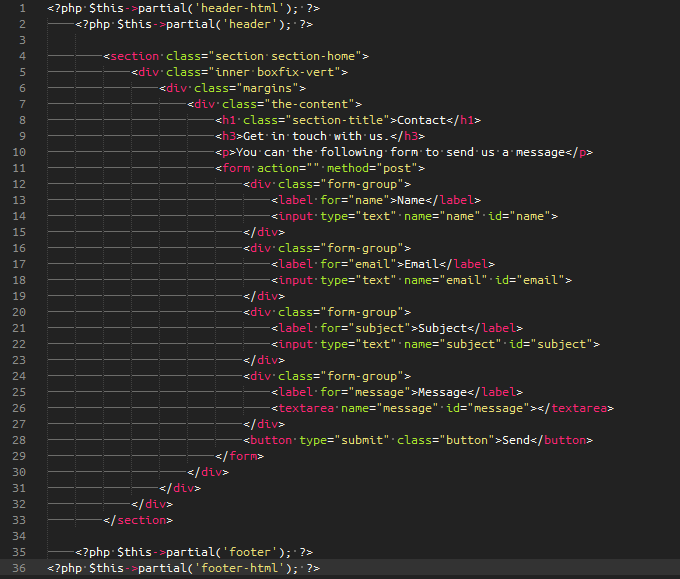 If you look closely, you'll notice that it doesn't have a complete HTML page. Its missing the html, header and body tags. It doesn't even have a valid DOCTYPE declaration! If you create a site with 10 pages, all of them will have the same code to declare an HTML document, open the html tag with its contents like stylesheets and meta tags, open the body tag with the page contents and then close everything you'll repeat a big chunk of code everytime. As you may have guessed, what the partial() function do is to simply take a fragment of code and print it in-place. Technical note: While the native include directive can do the same (in fact that's what partial uses internally), we're using a wrapper function to deal with security issues as well as to provide a properly initialized environment for the code fragment. There you can find the four partials refered on the Home page template: The two header and the two footer components. When you call the partial() function, it loads these files and adds them to the original page-home file, thus completing the HTML document. You may use partials for sidebars, widgets, toolbars and other finite components that can be reused on your site, and by including PHP code in them, you can validate or restrict certain features to very specific conditions, like hiding a toolbar if the user isn't allowed to see it, for example. 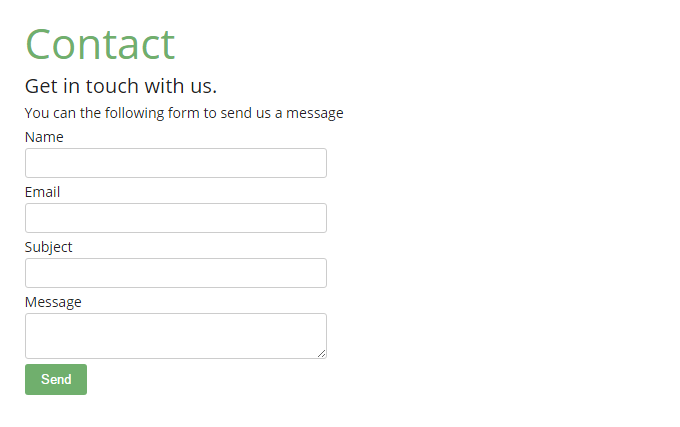 So, now that you know how the templating engine generates the pages, it's time to create our Contact page template. Technical note: Please notice how when you register the template you don't include the .php extension but when you place the file on your pages folder it must have it. That means you page is now properly registered and the template ha been correctly placed. Tip: To practice, create an 'About us' page on /about-us using the page-about-us template.